Google Adsense is the top Ad network for both low traffic & high traffic websites & blogs. Adsense performs very well (In terms of CPC & CTR) on Tech Blogs to Make money blogs, From Blogging tips to Entertainment Niche sites. But getting approval from Google Adsense is difficult. Each site is manually reviewed before Approval. There is a lot of things needed to be followed before applying for Adsense. Revenue hits is performance-based CPA ad network started in 2008. Revenue hits offer a lot of ad formats for Publishers to generate more revenue. Approval of websites is very easy. All sites are accepted as there is no minimum traffic requirement. After the signup Just place the Ad tags on the desired website where you want to show the ads. Minimum Payout frequency is 50$. Revenue hits offer 100% fill rates. 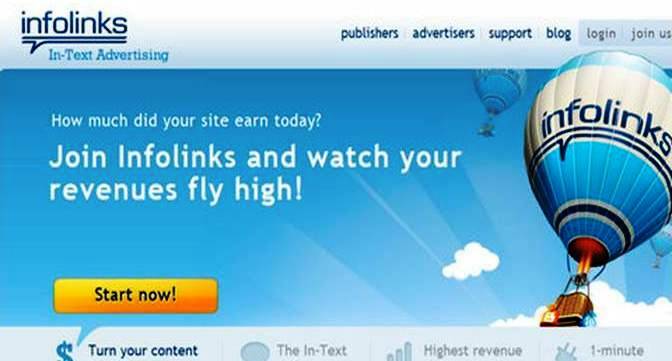 Infolinks is an In-text Ad network which is the Top Ad network for websites which have a lot of Text. Best suits for Article type of websites. They provide the highest click-through rates eCPM for publishers. There is no such traffic requirement to join this Ad network. Professional sites with a lot of text in it may get approval easily. If your site receives maximum views from the search engine, then you can earn huge revenue from this site. Chitika is one of the oldest networks. They started Ad campaigns in 2003. They provide good eCPM for publishers. As Chitika is a CPC (cost per click) Ad network, they show almost relevant ads to viewers. They have the low minimum payout of 10$ & provide monthly payments. If your website or blog is receiving good traffic from search engines, then Chitika is a good choice for publishers. There is no minimum traffic requirement to join this network. Just signup & place the Ad tags on your website & start earning money for every click received on Ads. Propeller Ads Media is one of the top Ad networks for publishers with high traffic. If your website receives a minimum of 10K views daily then propeller ads media is a good choice to display banner Ads. They offer good eCPM for Banner Ads. If your traffic is low then you can try their Popup / Popunder Ads & Mobile Ads. AdMediaking is a premium CPM based Ad network for publishers with minimum of just 5000 pageviews per month. They provide Popup & popunder Ads with 100% fill rates. They have a very low payout of 2$ only. They do not accept PTP, PTC, Auto surf traffic. & also they do not accept Adult sites. One of the Top CPC Ad networks for publishers with low traffic. They provide different types of Ad formats to monetize your websites with Best eCPM. You are not allowed to click on your own ads. They will warn you once. Repeated mistakes may result in an account ban. One of the Best CPC Ad networks for publishers with low traffic. Lot of Ad options to monetize your website. Low minimum payout with monthly payout. Sites with minimum 3000 unique page views per month can join this Ad network. They accept only High quality websites. Free hosted sites & blogs are not accepted. Adcash offers high quality ad formats for publishers with high eCPM rates. They require minimum of 50000 page views to join this Ad network. This network covered almost 196 countries worldwide. They offer Monetization of websites & mobile Apps. Sites with minimum traffic of 25000 page views monthly or 5000 unique page views monthly can join this Ad network. They accept only Top level domains & websites. Free hosted sites & blogs are not accepted. So it is quite difficult for new bloggers get approval from Rhythm one as there is lot of requirements need to be fulfilled. Qadabra is a good choice for publishers with Low traffic. They offer low minimum payout of 1$. Their eCPM is Average. Lot of Ad formats to monetize your websites. Simply fill up the registration form with proper details & submit for review. Yllix ad network has lot of ad formats for publishers with 100% worldwide fill rates. Get full control over the ads that you want to show on your websites with detailed reports. There is no minimum traffic requirement to join this network. Sites with good contents can join this network. Adult sites are also accepted. With Adotize Ad network publishers can monetize their Video, Display & Mobile traffic with high eCPM. There is no big traffic requirement join this network, but they review each & every site before giving approval. there is a bunch of conditions to join Adotize like Original & quality contents, traffic source, Domain rights & agreement Etc. They have low payout of 1$ only with monthly payout frequency. Adsblow is a new Ad network. They provide Display ads. want to get paid for only Impression can join this Ad network. they provide Avg eCPM rates. which are the best ones. They provide very good eCPM for popup ads. Adswinner is also a new Ad-network best suits for new sites. They accept almost all the sites. there is no such traffic requirement to join. Approval is very fast. you may get approval within few hours just after submitting the website. they provide display ads, Popup & pop-under Ads. Adhexa provides Display Ads, pop Ads & direct URL inventory Ad formats for publishers to monetize their websites. Their eCPM is Average. Fill up the registration form & after submit the site for approval. you may get approval very easily as there is no such traffic requirement. There is no big traffic requirement to join Media.Net but getting approval is difficult as Google Ad sense. They Accepts sites with high quality contents, Original, professional websites. Epom offers High eCPM for publishers. Websites with minimum of 500000 page views monthly with top level domain can join this Ad network. They accept sites with top level domain. Require Average monthly page views. They provide high eCPM. Require minimum of 300000 page views per month. They provide popup, direct URL inventory ads, display ads, sider Ads, Interstitial ads. Provide Good eCPM rates. But require huge traffic. Min 75000 Impressions per day.They accept only root level domain & They don't accept sub-level domains. They accept sites with top level domain. Require Minimum of 75000 monthly page views to join this Ad network. CPM, CPC ad network. 500000 monthly impressions required to join this Ad network. In case you are interested in making cash from your websites/blogs via popunder advertisments, you should embed one of the highest paying companies - Shortest.